Smart Manufacturing Market Is Likely To Reach A Valuation Of Around USD 395.2 Billion By 2025: Grand View Research Inc. 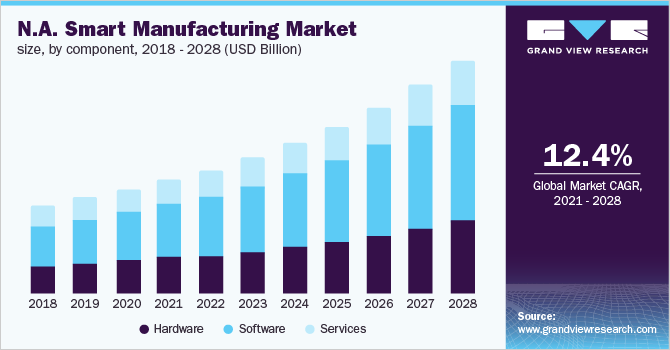 According to report published by Grand View Research,the global smart manufacturing market is likely to reach a valuation of around USD 395.2 billion by 2025. Increasing focus on improving production efficiency and visibility across the entire value chain can propel the market over the forecast period. According to the findings of a research report published by Grand View Research, Inc.; the global smart manufacturing market is likely to reach a valuation of around USD 395.2 billion by 2025. Increasing focus on improving production efficiency and visibility across the entire value chain can propel the market over the forecast period (from 2018 to 2025). In addition, rising investment in smart infrastructure from batch, continuous, and discrete manufacturers is also expected to be the crucial factor for the market growth. Manufacturing companies are increasingly looking for different approaches to cut the costs and to make manufacturing process faster, agile, and efficient. The smart manufacturing technologies can fulfill these demands and provide additional advantages including dynamic production, energy efficiency, and real-time optimization. Rising necessity to upgrade and modernize old-styled control systems to compete the international standards has led to digitization and convergence of IT and Operational Technology (OT). Thus, digital plants and advanced manufacturing techniques are set to upgrade companies, factories, production hubs, and complete value chain while boosting the fourth industrial revolution. Escalating demand for knowledge-based manufacturing processes and associated supply chains that are equipped with advanced control, modeling, sensing, and simulation abilities would bolster the market growth. 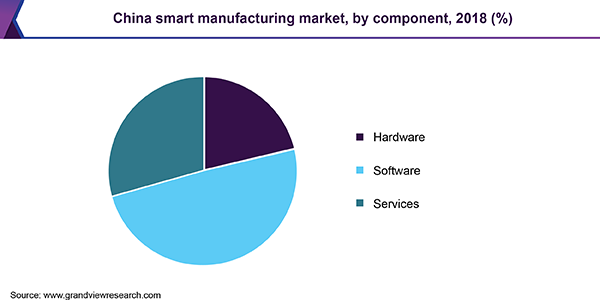 The global smart manufacturing market can be segmented on the basis of component, technology, end-use, and region. On the basis of component, the market can be categorized into hardware, software, and services. As per, technology, the market can be segregated into Machine Execution Systems (MES), Enterprise Resource Planning (ERP), Programmable Logic Controller (PLC), SCADA, discrete control systems, machine vision, Human Machine Interface (HMI), Product Lifecycle Management (PLM), 3D Printing, and plant asset management. The MES segment accounted for the major revenue share of the global smart manufacturing market in the past. This growth was mainly due to its high demand for streamlining workflows and to cut lead times. Escalating demand for industrial automation along with rising needs to comply with legal and regulatory framworks is expected to boost the segment development. The 3D printing segment is anticipated to have a significant growth during the next few years on account of its wide usage in the design procedures and agile product iterations. On the basis of end-use the market can be classified into aerospace & defense, automotive, chemicals and materials, industrial equipment, healthcare, electronics, oil & gas, food and agriculture, and others. The automotive and aerospace & defense segments are projected to be the major contributors toward the market development. At present, the automotive segment is the major consumer and is anticipated to grow at a CAGR of 12.0 % during the forecast period. On the basis of geographies, the market can be divided into North America, Europe, Asia Pacific, Latin America, and Middle East and Africa (MEA). Developed countries in the Europe and North America regions are observing high demand for smart manufacturing or Industries 4.0 and digitization. However, the Asia Pacific regional market is likely to have the fastest expansion over the coming years. The region is projected to capture a significant share of the global market over the forecast period on account of the presence of large number of manufacturing plants in this region. Growing government expenditure and initiatives encouraging the adoption of smart manufacturing technologies is also expected to drive the market in this region. For instance, China is making high investments in advanced manufacturing under the Made in China 2025 program. Prominent players operating in the smart manufacturing market include Honeywell International Inc.; Rockwell Automation, Inc.; Siemens AG; Emerson Electric Co.; and General Electric. Most of these market players have undertaken different marketing strategies including new product development, collaboration, partnerships and agreements, mergers and acquisitions, etc. to maintain the industry position.